“We have something for everyone!” declared Career Development Services (CDS) Executive Director Gregory Mass about the NJIT Spring 2019 Career Fair, to be held Feb. 13 at the university’s Wellness and Events Center. Indeed, the upcoming fair will feature some 200 employers — a gathering carefully curated by CDS to align with both the occupational interests of jobseekers and the recruiting needs of employers. Students seeking summer internships, no matter their grade level emphasizes Mass, should also attend, as the spring career fairs tend to offer more of this type of opportunity. 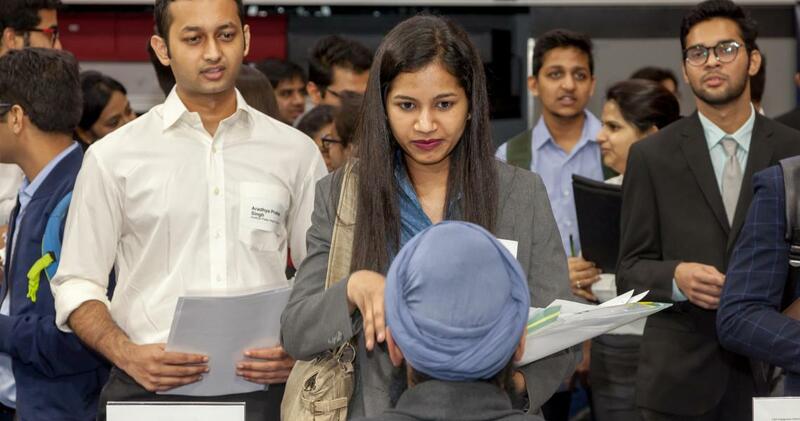 Career fairs remain an important avenue to employment (15 percent or so of every NJIT graduating class report that they found their first job as a result of meeting their employer at an NJIT fair). So, too, does an understanding of today’s hiring landscape. We spoke extensively with Mass about the hot jobs, personal branding, new recruitment practices and more. The following interview, the first of two parts, has been edited for length and clarity. What STEM jobs/careers do you see becoming more in demand either this year or in the coming years and why? STEM occupations have been the No. 1 in-demand career cluster for the past decade and will continue to be so for the foreseeable future. Globally, STEM occupations are leading the innovation economy movement — particularly so among those occupations involving Information Technology (IT). The need for IT skilled talent remains enormous, because all STEM fields have become highly reliant upon professionals with leading-edge software design and development skills. Moreover, IT talent needs exist across all business operations and organizations, whether you’re a Fortune 500 company or a startup enterprise. Public sector, private sector, government, big company, small company, university, school, manufacturing — IT touches everything. What we are seeing now and I think will continue on a very large scale are graduates needed to fill roles in big-data management and cloud computing. The need for data storage, for access to data, and for analyzing and using data has never been more important. So data analysts, cloud computing experts, web developers, software developers, architecture individuals who are skilled in the storage, manipulation and making sense of incredibly large data sets, whether it’s for medical informatics, consumer demographics or buying habits, are greatly needed. The second area that I think will move from emerging to exploding with opportunities is cyber and infrastructure security. It’s become so prevalent with all of the major data breaches that have occurred recently. We’re such a global marketplace and so competitive, so to be vulnerable to cyber attacks is risky from a world economic perspective. Additionally, all of the design-build professions are projected to remain strong. There is a steep rise in commercial, residential rental and infrastructure replacement/improvement supporting multiple engineering and architecture jobs growth. There is also tremendous support for revitalizing manufacturing in the United States at this time. For this to occur, investment in advanced manufacturing equipment and processes will be an absolute requirement, as will the need for educating and training the next generation of workers. Are there any trends to note for 2019? To start, companies will place greater emphasis on promoting their brand on college campuses, specifically as a desirable place to work. Among the determinants students consider to be important are workplace culture, job responsibilities that include regular exposure to innovation and technology development, overall compensation, opportunities for continuous education and training, and degree of work-life balance. A large part of employees’ social interests and extracurricular interests will be fulfilled by the workplace. Also, while employers will broaden their engagement efforts across STEM-focused campuses, and career fairs — which provide a tremendous source of tech talent — will continue on a large scale, there will be a decrease in traditional campus recruiting activities, such as on-campus interviewing. This is due, in part, to converting interns and co-ops to full-time hires, which has become a preferred strategic tactic by employers. Moreover, employers are seeking to identify and establish connections with students as early as the freshman year, and in some cases even before they start school. Pre-internship programs to attract first- and second-year students will increase, and many organizations, especially large financial and business service firms, will strategically redesign their summer employer programs. We are seeing a movement toward 10-week super-charged internship programs with a limited suite of programs available for summer experiences, with mentoring opportunities and senior leadership that remains engaged throughout the program. What is the job outlook for international students? International students do face a more difficult set of challenges than do domestic students with regard to their job search. Issues involving visa requirements, and U.S. governmental restrictions placed upon employers, reduce the amount of prospective employment opportunities. What our international students, and especially our graduate students, have in their favor is that the U.S. isn’t producing enough high-caliber STEM talent to fill the need. Additionally, most of our international students have strong tech skills and prior professional work experience from their home countries, and now they have an advanced degree. NJIT strongly supports the job-search efforts of our international students. We were one of the first universities in the country to have a formalized graduate student co-op program. When international students become engaged with our office, follow our advice and take advantage of our many career resources such as getting hands-on work experience, the chance of gaining employment is significantly stronger. Look for Part 2 of “Career Fairs, Job Tips and Employment Trends: An Expert’s View,” coming soon.